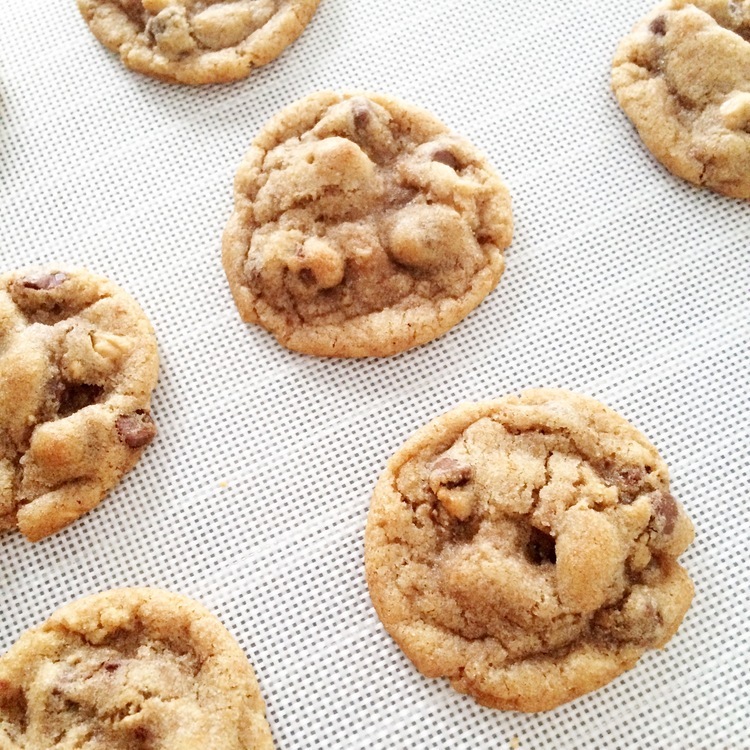 The most perfect, ooey-gooey, foodgasm-inducing chocolate chip cookies. The kind of cookies that melt in your mouth and warm you from the inside out. The kind of cookies you'll want to go that extra mile for (literally and figuratively—LOL!) because O-M-G they are golden brown and baked to perfection! You guys know we take our cookies very seriously. We love cookies so much they made it into our bio. Finding the perfect chocolate chip cookie recipe was no easy task. We'd been using a family recipe for years but always felt something was lacking. It wasn't until this spring that Chloe finally put her finger on it: the "cookie" part of our chocolate chippers just wasn't...great. "I want the actual cookie to taste sooo good that it would be delicious even without the chocolate chips!" she explained. So she set out to do just that—scouring Google and Pinterest, analyzing ingredients and reading hundreds upon hundreds of reviews until she finally found THE ONE. And let me tell you: It was love at first bite. So what makes this cookie superior to all others? What do we look for in a cookie? The perfect chocolate chip cookie is never rock hard and never too doughy. You don't want it so thin that it overcooks, nor do you want it so thick that the inside is still raw (yuck). You want it soft in the middle with just the right amount of crispiness around the edges. What really set this chocolate chip cookie apart from all the others was how sweet and flavorful the actual cookie part was. Like Chloe said, a cookie shouldn't just taste good because it has chocolate chips in it! The cookie needs to be able to stand alone and taste BOMB. 1. Preheat oven to 350 degrees. 2. Combine flour, baking soda, baking powder and salt. Mix and set aside. 3. Cream butter and sugars together with a mixer until just blended. Use room temperature butter. DO NOT MELT OR MICROWAVE YOUR BUTTER! 4. Add eggs one at a time, mixing well after each addition. 5. Add vanilla. 6. Add dry ingredients and mix on low speed. Mix until combined—do not overmix. 7. Stir in chocolate chips. 8. For big cookies, use a 4 tbsp size scoop to form your cookies. But feel free to experiment with the size to suit your taste! 9. Place on cookie sheet and bake 10-17 minutes. Each oven heats differently, and the size of your cookies will make a difference. If you refrigerated your dough, take that into consideration as well. We recommend keeping a close eye on the first batch to ensure your cookies bake to golden perfection. 10. Once out of the oven, place cookies on a cooling rack. 11. Save any remaining dough in the refrigerator. We prefer doing this over baking all our cookies at one time. That way we can make cookies the next day and they'll be baked fresh!